This book is going to stick in my mind for awhile, if for no other reason that it arrived just a few days ago and I knew I needed to devour it in time for a book tour I agreed to participate in today! Usually I read a book, think on it for a bit, and set a review to publish a few weeks out. This gives me time to mull over it a bit and adjust my thoughts and words. I don't have that luxury this time so we'll see where this goes. Smells Like Dog is one of the latest offerings from Little Brown Kids (they are the ones who published Tumtum & Nutmeg, if you'll recall) and the premise sounded too intriguing to pass up. In short - Homer Pudding is a pudgy farm boy who dreams of being a treasure hunter/explorer like his favorite uncle, Drake. The problem is that his dad is dead set against the idea of Homer turning out to be like Drake. His dad doesn't approve of Homer's desire to explore the world, while his mother encourages her son's "interests." One day word comes that Uncle Drake has met an untimely death - having been eaten by a giant man eating tortoise. Drake's "most treasured possession" has been sent to his surviving nephew, young Homer, upon notice of the death. This mysterious possession? A dog who is wearing a collar which has attached to it a gold coin with the following letters on it: "L.O.S.T." What do these letters stand for and what makes this coin so special? This is a book that is easy to give spoilers away to and I don't want to do that so I'm going to be careful with what I say. Let's just boil this one down to the basics, shall we? 1. It was a really cool mystery/adventure story for young readers. Homer is a likable young man who is driven by his passion for reading and studying maps. The dog that his uncle has sent to him is lovable from the get-go. I am not a huge animal lover - but I can't help but like this particular basset hound. Dog and boy bond in a way that I found charming and I was cheering on their friendship throughout my reading of this story. This book would definitely rank high on the "Happy Dog Stories" list. 2. I liked the element of treasure hunting. It gave the book a whole National Treasure feel. Homer's Uncle Drake had found a rare and much-sought after treasure map that was the envy of treasure seekers everywhere. The map is hidden and Homer is trying to figure out where his uncle put it. The question in the book is - who will get to the map first? There are all sorts of quirky characters and the reader isn't really sure who is to be trusted at any point in time. It's a lovely suspenseful sort of read. Well. Rather - it's my type of suspense! 1. Homer Pudding's family bicker a lot with each other. His father is frustrated and his mom is sweet - but misguided - in her solo effort to make each of her children feel special and loved. Homer has a fifteen-year-old sister who has an attitude with a capital "A" and I didn't care for her character at all. 2. Homer runs away from home with his older sister in a fit of frustration over not being able to communicate with their father. Mr. Pudding is played off has being clueless about his children and overbearing in general. In the end, these family issues are resolved. When I started the book I wasn't sure where Selfors was going to take the family or how she was planning to work out their personal difficulties. However, as I read along the book had a sense that things would conclude well between everyone and so I wasn't too concerned. Ultimately - I was easily entertained by this read. It's not The Mysterious Benedict Society, mind you, but it is kinda fun. Actually, it reminds me quite a bit of From the Mixed-up Files of Mrs. Basil E. Frankweiler . If you like either of the aforementioned titles, then the chances of you enjoying Smells Like Dog are fairly decent. Like I said though, I am a little perturbed by the children's attitudes towards their parents. The good news is that Homer does grow to realize the benefits and blessings of having family. Furthermore, his dad recognizes the fact that he (really was) being entirely too harsh with his children. Things smooth out. For that reason, my vote swings towards a thumbs up of this particular book. Suzanne Selfords writes a good story and makes off-hand remarks throughout the book that made me chuckle a time or two. I'd definitely suggest this book be read by children over the age of 12 simply because of the family dynamics. I would want my own children to understand that Homer's solution to solving his parental problems was not the best course of action. But as is the case in adventure books of this sort - children can run away and are always returned home safely and with a good story to tell of where they went. 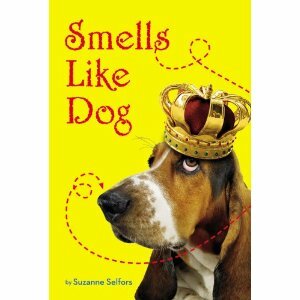 I liked reading Smells Like Dog for myself. (I do tend to enjoy Middle Grade adventure stories.) It was just a fun diversion. Every so often, this kind of book is exactly what I need. Fun, adventurous, and not without its share of quirky characters. A good and solid conclusion ends up providing a good time. THIS REVIEW ORIGINALLY POSTED AS A GIVEAWAY. THE GIVEAWAY IS NOW CLOSED. Thank you, Carrie, for the thoughtful review. I would love to read this one. Please enter me! I enjoyed your review and would love to read Smells Like Dog :) *Thanks* for the giveaway! I loved both of the books you compared it to so count me in! Entry #2 - I am a subscriber! I like the way you divided up your review. It really piqued my interest! Please enter me! Great review. Count me in, please. This sounds like a great one to read out loud to the boys! Enter me please! your blog is THE blog I read the most! Sounds like a fun read-aloud with my mystery loving boy! I think my daughter would love this. I would like to read this--sounds fun! I love the thoughtful review you gave to this book. I am currently working on my MLIS and plan on being a children/YA librarian. I love the titles that are bing written for youth these days and this one is right up my alley. I believe I would have a child who might want to read this! Please enter me. Thanks for the giveaway - please enter me!! I am very curious about this book and would love to win it.